Below you will find a sampling of some of the more common aquarium shapes. 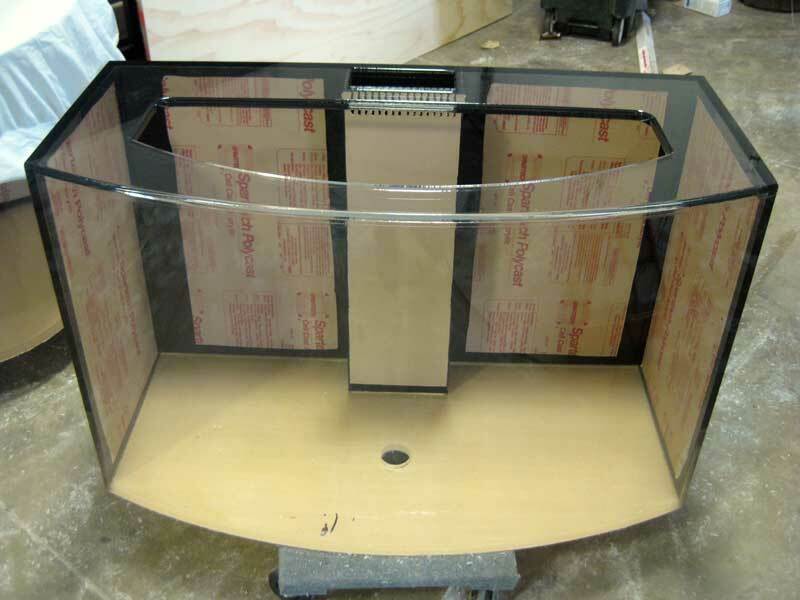 Midwest Custom Aquarium routinely builds any of the shapes below and many more. The brief descriptions are a generality only as there are many more applications for each than what is described. Pictures of examples are of the tank only so you can better see the overall shape of the tank itself. 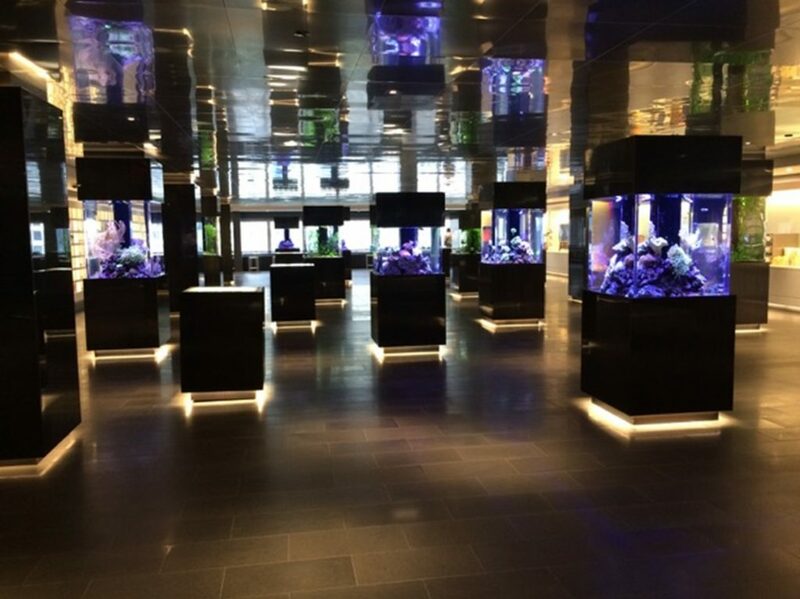 Because the cost of aquariums is of interest to any prospective purchaser, a comparison to other tank shapes is given to give you a general idea only. Many more examples can be found in the photo galleries. The simple rectangle is undoubtedly the most popular aquarium shape there is and will always account for the majority of all aquariums. Because of its shape, it is also the most versatile, as it can be used in almost any setup. They may be placed against a wall, into a corner, built into a wall, used as a room divider or peninsula, set up as an island, etc. The possibilities for setting up a rectangle aquarium are unlimited. A wide variety of overflow types may be used, and may be placed virtually anywhere in the tank. 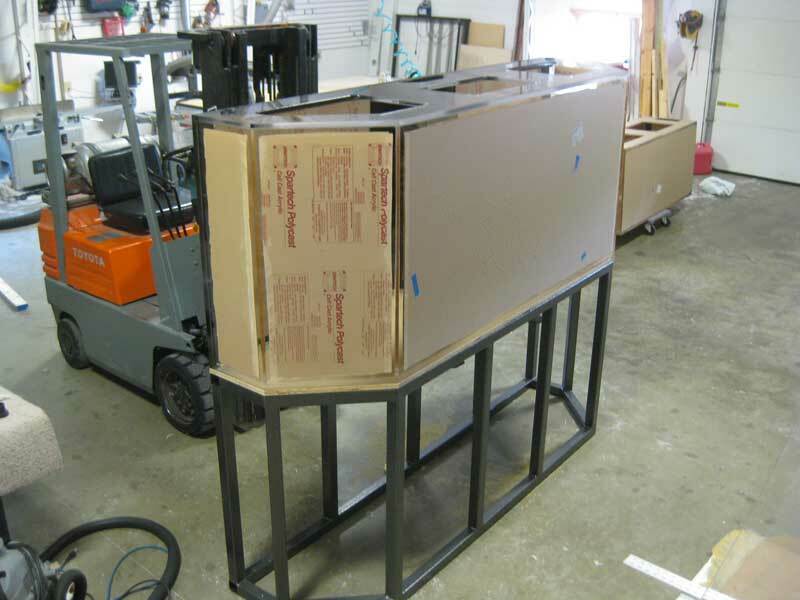 A rectangle will usually be your most economical aquarium to have built. The corner pentagon is a favorite shape for utilizing a corner. It has 3 viewing panels that become the focal point of any room. It is an efficient use of space, and is capable of holding many gallons when compared to the little area it takes up. If you don't have enough space on a spare wall you may want to consider the corner pentagon. Best overflow style is usually the corner 45 (as shown in the example), as the tank will appear to have no overflow and will not have any corners sticking out into the tank. 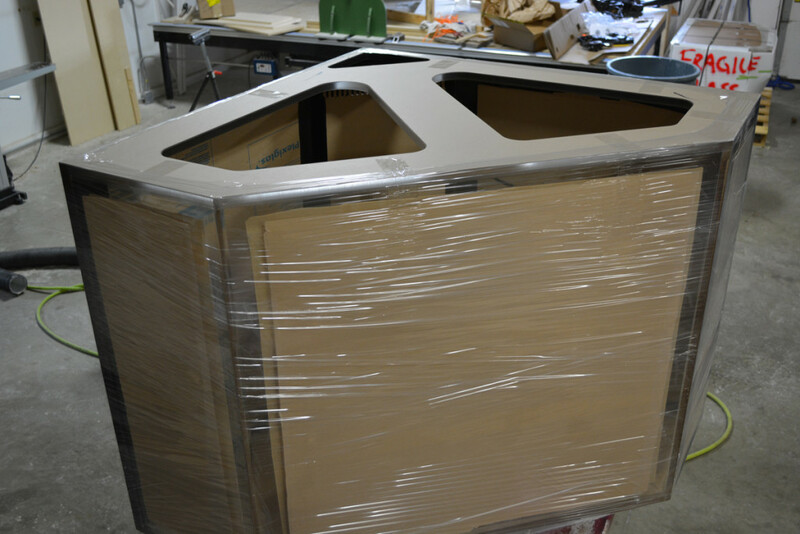 The two 45 degree angles between the 3 viewing panels will either be bent or mitered. If bent, there will be a band of distortion surrounding the bend. Most tanks thicker than ½” will have mitered corners as the band of distortion surrounding them gets wider on the thicker materials. A mitered corner does not produce distortion and gives a neater, cleaner look. It is also easier to make cabinetry trimwork match up with a tight corner versus the radius you would have with a bend. Bowfront. The bow front is a popular choice for those who want something a little more unique than a basic rectangle. Its graceful convex front is a seamless formed sheet, free from obstructions. Bow fronts are most often used in traditional setups, where the back is against the wall and the front and 3 sides are viewed. They can also be used in other applications as well such as built-ins, see-throughs, etc. The degree of radius can be specified if necessary. Measurements should include the length of the short sides as well as the dimension to the outermost part of the bow. 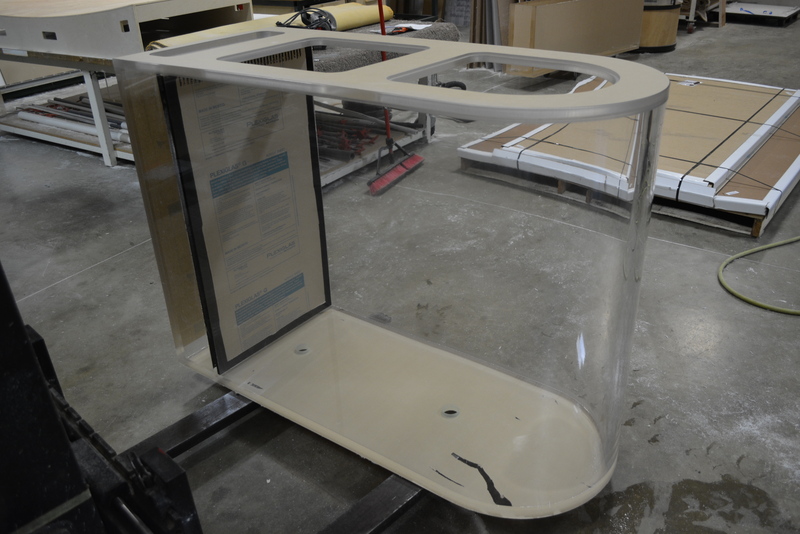 Because we have to make a mold and oven form the front panel, cost will be higher than a rectangle of the same size. 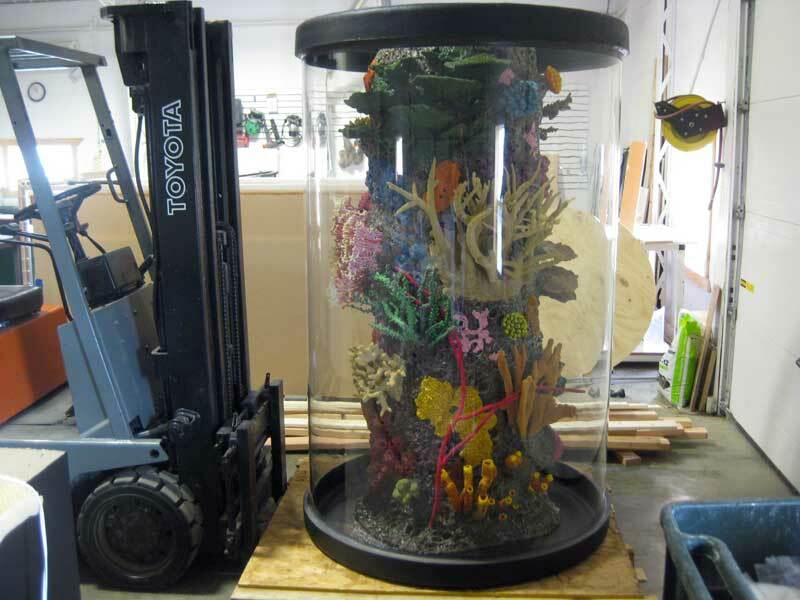 The cylinder is a good option that provides 360 degree viewing for applications where the aquarium will sit out in the middle of a space as a centerpiece. 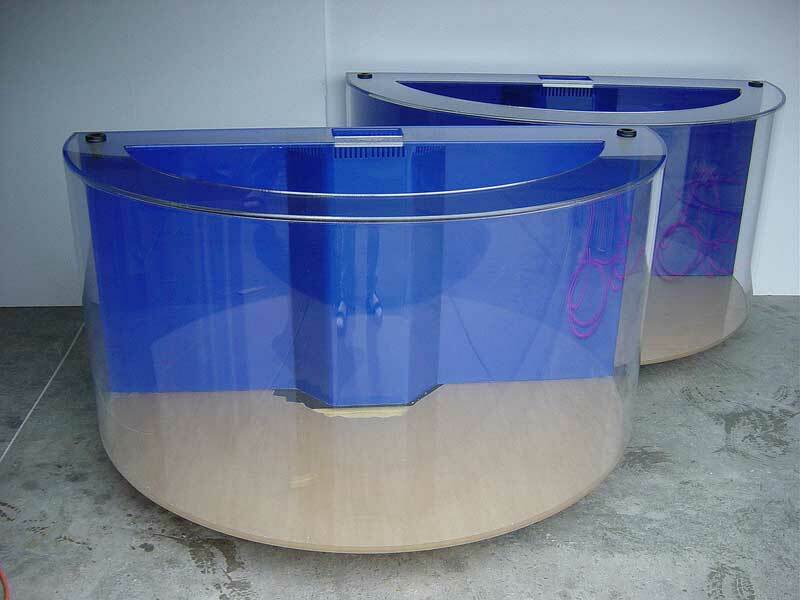 Cylinder aquariums are available either seamless or seamed. A seamless cylinder is available only in certain diameters and is cast as a single piece so it has no vertical seams. 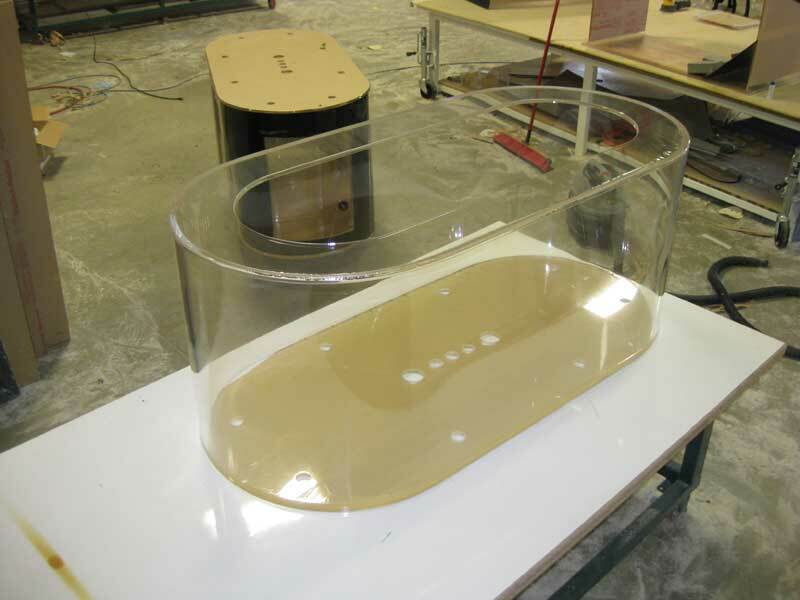 With our thermoforming and bonding capabilities Midwest Custom Aquarium also fabricates seamed cylinders by forming and joining two halves. A cylinder built this way will result in 2 vertical seams in the body of the tank, which are not very noticeable and appear as a thin line or as a narrow width of distortion. We have a hard time getting them to show up on a camera. We generally only do these in diameters from 4-6 feet. Max diameter we can get from a 120” long sheet is around 6 feet. Reasons for a seamed version are usually due to cost as they are usually less expensive than a seamless tank. The taller the tank gets, the less this holds true. The flat back hexagon is a good substitute for a rectangle or bowfront. Most applications will have the long back side up against a wall and viewed through the remaining 5 panels. It will also work well for a built-in. The four 45 degree angles between the 5 viewing panels will either be bent or mitered. 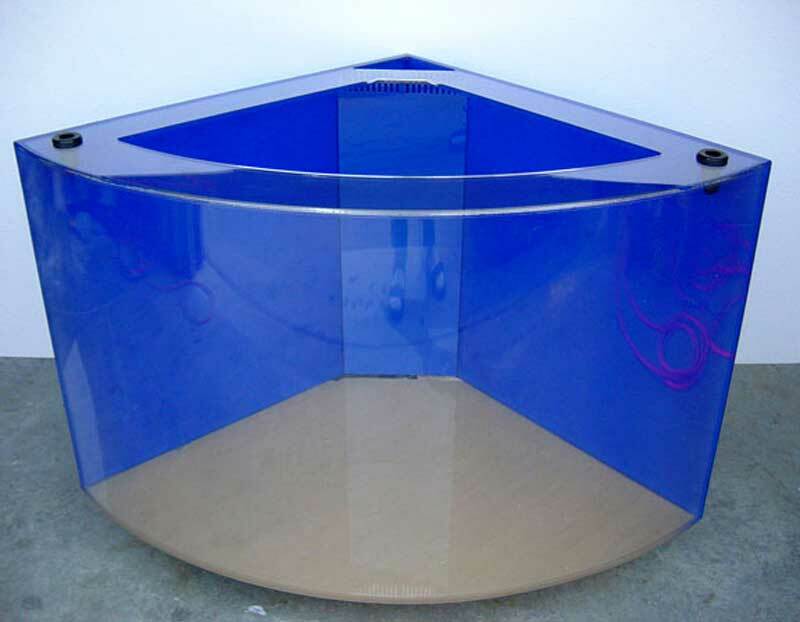 Bent tanks are reserved for the smaller aquariums, as the 5 viewing panels have to come from a single sheet, which are limited to in size. If bent, there will be a band of distortion surrounding the bend the same as a corner pentagon. Most tanks thicker than ½” will have mitered corners as the band of distortion surrounding them gets wider on the thicker materials. A mitered corner does not produce distortion and gives a neater, cleaner look. It is also easier to make cabinetry trimwork match up with a tight corner versus the radius you would have with a bend. For larger Flat Back Hexagons the corners will have to be mitered. The cost of a Flat Back Hexagon will fall somewhere between the cost of a rectangle and bowfront of the same size. The quarter cylinder is an ideal corner tank with no bends or corners but rather a smooth, seamless viewing area. This shape is a good alternative to a corner pentagon. The quarter cylinder's thermoformed front provides an elegant look and is a beautiful tank for any corner application. Like the corner pentagon, it is ideal for getting a lot of gallons into a comparatively small space. Normally an overflow is set into the back corner at a 45 degree angle so it is largely unnoticeable. Usually the 2 back panels will be colored. Quarter cylinders can be made in a wide variety of diameters and very large viewing panels are possible. Another plus is that only the curved portion of the cabinetry needs to be finished as the rest is not usually seen. They will cost a bit more than a corner pentagon of the same size as we have to build a mold and thermoform the viewing panel. Half Cylinder. The half cylinder makes a beautiful addition to any room for those looking for something more custom and unique than a traditional rectangle. Perfect for those who would like a stunning showpiece that provides a seamless 180 degree viewing area, a half cylinder looks beautiful from any angle. There are no obstructions no matter where you are viewing them from and with the forming properties of acrylic, they do not distort like glass half cylinders can. The back is usually colored, typically with a single overflow centered on the back. We build them in many different diameters. 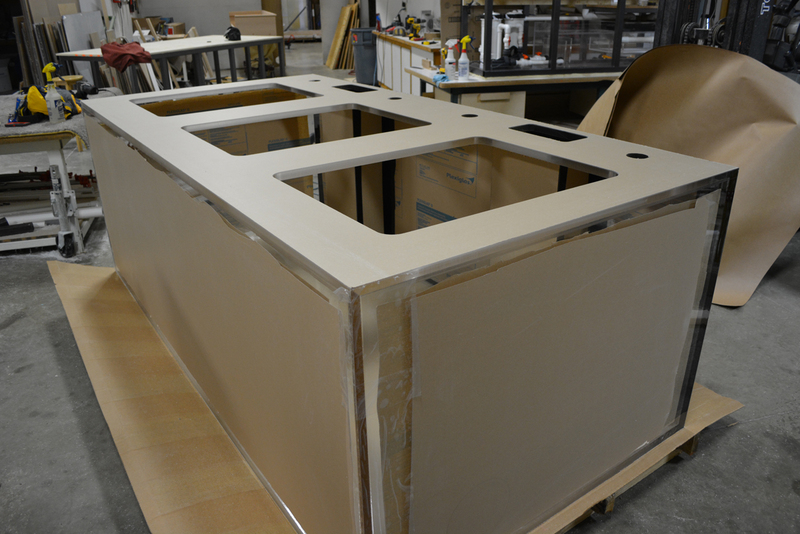 They will cost a more than a rectangle of the same size as we have to build a mold and thermoform the viewing panel. Same tank as a bullnose except 2 rounded ends instead of one. This shape will usually be used in applications where there is 360 degree viewing. They are a common alternative to a cylinder and a always a beautiful, graceful tank. This shape is often used for sharks or other inhabitants that are always on the move or subject to skin lesions as a result of bumping into corners. The rounded ends prevent this. If used in a 360 degree viewing application the overflow(s) will typically be in the center of the tank whereas the inhabitants can swim around them. This shape will require 2-4 vertical seams as the tank is built from flat stock. They are nearly invisible and don’t show up in the accompanying example. The cost will be quite a bit more than a rectangle, and a bit more than a single bullnose of the same size. 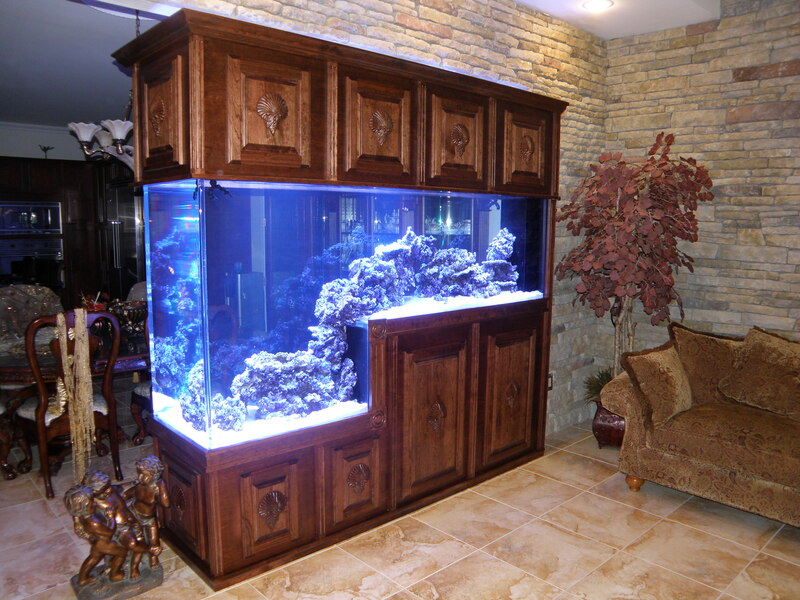 A bullnose makes a beautiful peninsula type aquarium, whereas the flat end goes up against the wall. It is a nice substitute for a rectangle which can be set up the same way. No square corners and a graceful front. If the tank is smaller the entire viewing area can be seamless. If the total length of the viewing areas are larger than the length of the sheets available there will need to be a couple vertical seams. They are not very noticeable at all. They will be quite a bit higher priced than a rectangle of the same size as a mold and forming will be required for any, and vertical seams will be required for the larger ones.